Home / The Week it Got Loud! The Week it Got Loud! Mercifully, I’m not one prone to bouts of tinnitus. If I were, last week would have been one for the record books. What was the cause of this loudness, you ask? Well, if you’ll indulge me, I’ll happily tell you. I have a pal who takes a week of her vacation each year so that she can work as a volunteer during TIFF (Toronto International Film Festival.) As a perk of that “job” she gets first crack at buying tickets to various and sundry events around the city. 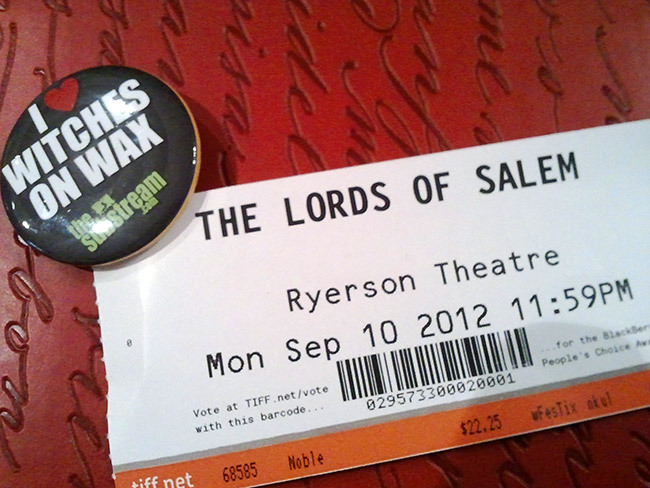 This year, she was kind enough to procure tickets enough so that LX and I could go with her to the Red Carpet Midnight Madness screening of Rob Zombie‘s The Lords of Salem! 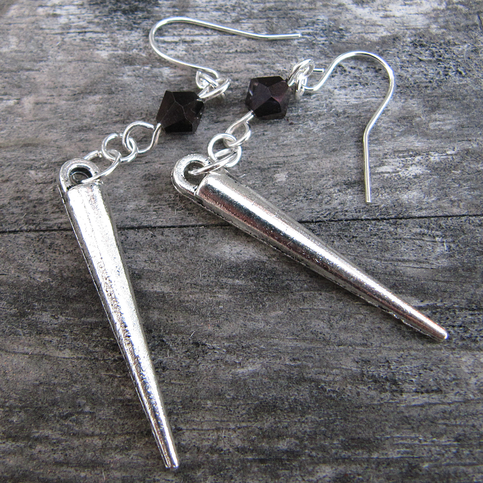 In honour of the occasion, I whipped up a new earring design (that I’m now making in a number of different colours) that seemed fitting of the occasion (a wee bit of bling for the red carpet; a metal spike to keep with the theme.) I’ve named it Heavy Metal Glam. But I digress. The topic at hand is Rob Zombie. Rob Zombie and his new movie. Rob Zombie, his new movie and the fact that we got to attend the Red Carpet Premiere! Oh… and did I mention that he and his wife sat two freakin’ rows behind us? Yeah. They did. No big deal. As always, I had my camera with me. Have a peak! And, even though it was a midnight screening, it was clear that this was not your garden variety TIFF screening – the pounding Rob Zombie music was our first clue; the kids in costume filling the first few rows were our second. The movie, itself, turned out to be decidedly more arty and WAY less gory than I had anticipated. And I do hope it hits theatres soon, because I’d really like to see it again. And this was only Monday. 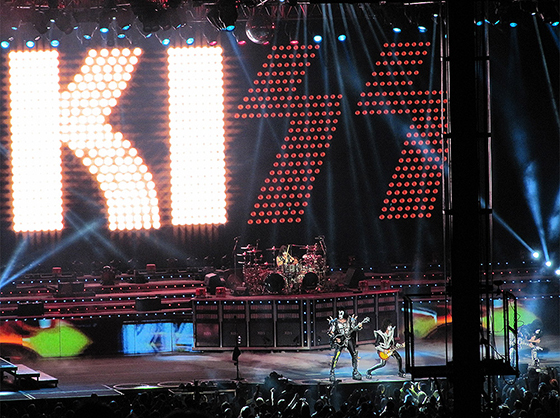 Because I refuse to grow up, I seem to attend every KISS concert that hits Toronto. And there seems to be one every single year. This time it just happened to fall during the same week as TIFF. And, when you live within walking distance of Toronto’s Molson Ampitheatre, it seems a moral imperative to attend at least one trashy metal concert each season. This season it just happened to be the double bill of KISS and Mötley Crüe. Seriously. If you were in the lawns last Thursday, then you know that there was more leathery skin, weathered spandex and premature leather (it was close to 30°C) on site than you could shake a stick at. Interestingly, there were a LOT of kids in attendance. And not just wee ones being dragged out by their diehard fan parents, either. There were teenagers and twenty-somethings there of their own accord. There’s something to be said for a band’s staying power. The main event, however, knocked it out of the proverbial park… as they do every single time. 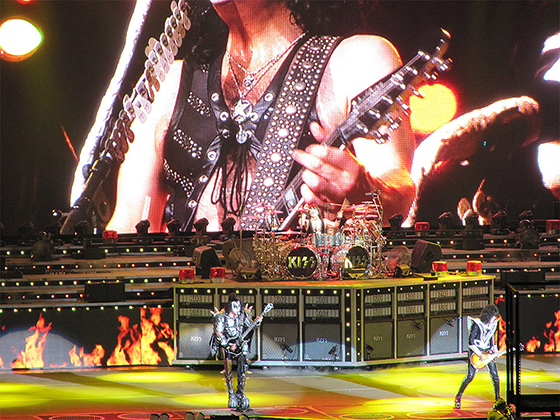 Love their music or hate it, there’s no denying that KISS is a spectacle that everyone should see at least once in his or her lifetime. Fire breathing? Check. Blood spitting? Check. Over-the-top and instantly-recognizable costumes and Kabuki makeup? Check. A 50-something and 60-something guy in platforms taking flight? Check. Confetti and fireworks? Check and check! And, would you believe that – after 30-plus years – they’ve got a new album coming out next month? These guys are no spring chickens (not by any stretch of the imagination) but they sure do give you your money’s worth when they perform live. This week has been delightfully quiet. ← …and in other news: Weezie World has a store!